As a felinophile (i.e., cat lover), your job is to help your animal make better business decisions. By that we mean doing his "business" in the litter box rather than the living room floor. To ensure this, he needs the right tools to get the job done, including a clean and well-placed litter box filled with a material that he finds inviting. 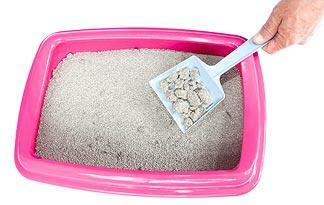 When it comes to cat litter, the question usually comes down to whether to use clumping versus non-clumping material. To answer it, let's first take a look at how these materials work, the benefits and drawbacks and the best way of switching from one type to the other. Most litters are made of absorbent clay. This works very well considering that when ground to powder form, clay has a remarkable ability to absorb waste and neutralize odor. And while clay litters all work on the same basic principles, there are two main types that are commercially produced: clumping and non-clumping. Traditional, non-clumping litter has been around since just after World War II. Its main component is calcium bentonite, a type of clay capable of absorbing approximately its weight in fluid before reaching its saturation point. After reaching the saturation point, the litter should be replaced and the box should be cleaned. The whole process takes about a week, assuming you use a standard-sized litter box filled with a few inches of litter, according to the American Society for the Prevention of Cruelty to Animals. The clumping variety is made up primarily of sodium bentonite. The main difference between this and calcium bentonite is that sodium bentonite clumps together when it comes into contact with moisture. It also binds the moisture within the clump so it can be easily scooped out, leaving behind a box of clean litter. In theory, a box filled with clumping litter would need less frequent cleaning than one with non-clumping clay. A good rule of thumb is to scoop the box every day, add litter to maintain a relatively constant depth, and completely replace the litter and clean the box every two to four weeks. However, this depends a lot on the habits of your cat. Generally speaking, if the cat box stinks, clean it. Which litter is best for my cat? The best way to determine which litter is best is to simply give your pet the choice. Start by trying them one by one to see which works best; you might save some hassle by buying three or four varieties at once and conducting a litter preference test. To do this, fill a few pans with the different litters, line them up, and see which one your pet likes best. Chances are he'll sample each, but only pee in his favorite. Once you've determined which litter your cat likes, it's important to stick with it. Most cats don't like changes to their routine. If your cat prefers an unscented brand of litter (which they usually do), but you like the one with a hint of lavender, let him have his way. The last thing you need is for your perfectly litterbox-trained pet to rebel and start pooping on your pillow. How do I switch my cat's litter? - Introduce only a small amount (around 10 percent) of the new litter by mixing it in with the established variety. - Gradually increase the ratio of new litter to old over a period of a few weeks. - Watch your cat closely for signs of litter box reluctance or anxiety.